There's an old adage that continues to persevere today about a person not being able to look themselves in the mirror out of remorse over the things they've done, an idea revolving around damaged morality and the impact one's decisions have on their perception of themselves. Victorian playwright and author Oscar Wilde manifests this concept rather overtly in his gothic horror-drama novel The Picture of Dorian Gray, which also explores the superficial importance and deception involved with appearances through an enigmatic painting that preserves youth and, in response to the subject's decisions, changes in form with time. 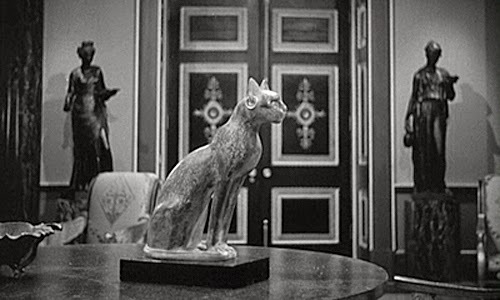 While writer/director Albert Lewin takes a few liberties in illustrating a romanticized version of Wilde's story, his atmospheric and ominous '40s adaptation fully captures what makes the immortality, and immorality, of Dorian Gray a considerable philosophical yarn: the soul-searching austerity of hiding one's wrongdoings beneath an unblemished facade. The story picks up just as Lord Henry Wotton (George Sanders), a hedonistic socialite with no form of employment and plenty of opinions, visits the home studio of his more compassionate artist friend, Basil Howard (Lowell Gilmore), who's obsessing over a portrait that seems to be taking on a life of its own. Basil's subject is the titular Dorian Gray (Hurd Hatfield): a slim, temperate gentleman with a welcoming outlook on life. As they chat, however, amid interruptions from Basil's niece, Wotton plants seeds of existential doubt in Dorian's mind, about the transience of youth and the necessity for enjoying life to the fullest before it fades. In those moments, while in the presence of a conspicuous Egyptian statue, Dorian expresses his wish to remain as youthful as the portrait. That wish is granted; however, as he makes choices amid a new pleasure-seeking lifestyle and develops a budding romance with performer Sybil Vane (Angela Lansbury), the portrait responds to how he conducts himself. Dorian remains physically flawless, while his painting morphs into something grotesque. For all intents and purposes, Basil and Lord Henry play the angel and the devil on Dorian Gray's shoulders -- one speaks of virtue and devotion, the other of the necessity behind immediate gratification -- to which Oscar Wilde's story then focuses on the happenings when the now-ageless man surrenders to boundless pleasure-seeking, without regard to those around him. Albert Lewin's crafty reverence to the source material captures its themes in a timeless, dark fashion, gravitating towards cautionary introspection about vanity and mortality through the film's often morose speeches. While there are departures from Wilde's text, like a subtle Egyptian-inspired explanation to the painting's magic and the importance of Basil's niece later on, they're so effortlessly folded into the author's intentions that they strengthen the story's cinematic language instead of sticking out as unnecessary addendums. Everything here has a role to play in the manipulation of Dorian Gray, and his manipulation of others, sketching a credible depiction of his moral collapse and skewed perspective on the value of time. For those deeper meanings to surface, Wilde's story needs to convince the audience that a nobler and warmer version of Dorian Gray exists, a side of himself that gets locked away to make room for a superficial narcissist . Hurd Hatfield's skeletal frame and chilly impassiveness are a uniquely handsome fit for Dorian Gray's malleability, his deceptive grin and piercing eyes creating a distinctive vessel for his personality as he becomes transfixed with the evolution of Basil's painting. The Picture of Dorian Gray elevates his abandon at first with classic '40s-era romantics, portraying his relationship with Sybil Vane -- played with tender, unembellished loveliness by a young Angela Lansbury -- with the proper innocence and suggested caution from Lord Wotton around the disparity in their social classes. The corruption of this innocence happens in abrupt and melodramatic fashion in the film, but not without first expressing Sybil's profound impact on him ... and his difficulty in choosing between the hedonistic freedom championed by George Sanders' charismatically unscrupulous Lord Henry and restraining himself for the sake of his "yellow bird". Moody shadows, lofty ceilings, and foggy walkways of Victorian London surround Dorian Gray's descent into self-indulgence, uncannily framed by Harry Stradling's Oscar-winning deep focus photography. The gloominess appropriately reflects the story's focus on a visual manifestation of a person's soul in response to the careless decisions made in their life, mirroring its ominous abstractions about the nature of sin, experience, and reputation. Director Lewin lets Dorian's lecherous endeavors occur off-screen, smartly letting the imaginations of ever-changing audiences fill in the gaps of what goes on in the city's dens of indulgence. 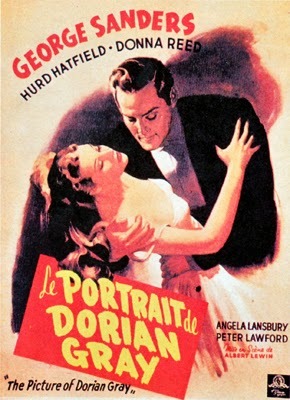 In other ways, The Picture of Dorian Gray grows darker as it progresses: the people and events in Dorian's life fester in response to his decisions much in the same way as his painting, the mistakes he's made and the people he's known -- including Basil's niece, Gladys, delicately played by Donna Reed -- coming back to haunt him in ways both physical and emotional. Perhaps the most intriguing about The Picture of Dorian Gray is the painting itself, becoming its own intermittent character as it reaches its final grotesque form through a brilliantly macabre painting from Ivan Albright, commissioned specifically for the film. Director Lewin understood the power of the painting, too, both in the narrative and Albright's work itself, evidenced by his strategic, poignant usage of color several times throughout the film specifically to heighten its impact. With punctuated musical notes in the background, these moments are consciously disruptive, first with the mere presence of vivid color amid the monochrome Victorian environment and then in observing the full nuance of the putrefied being underneath Dorian's skin. 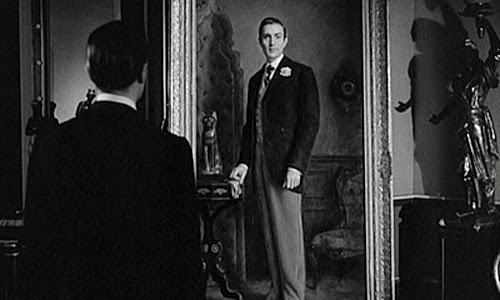 Unlike people who cannot bear to look at themselves in the mirror after they've done something unforgivable, Dorian finds it difficult to pry away from looking at the person he's become, and the disquieting brushstrokes that compose this adaptation makes it difficult for the audience to look away as well.